Up until now I've been pretty good at keeping my UFOs (UnFinished Objects) to a minimum. It seems I just can't contain myself though. There are so many quilts I want to make and so many new techniques I want to try. Neither my hands nor the hours in the day can keep up with all my desires. Since this is the first month in a new year, and I have warmed up my blogging chair a little, this might be as good a place as any to take a little inventory. First, there is the above pictured Dresden Plate quilt top that needs to be quilted. initially I wanted to free motion quilt this, but it might be nice to quilt it by hand. It has been a while since I've done that and it might be nice to get back to basics with this classic Dresden design. Or, I could do a combination of both free-motion quilting and hand-quilting. Until I get it put together with backing and batting, I won't really know. I still have Christmas fabric sitting next to my sewing machine, just begging me to cut it up into pieces, to be sewn together. It might be nice to get ahead of the game for a change. I still have one more project to do from my recent Craftsy class, Quick Strip Paper Piecing. I have to try my hand at Peggy Martin's New York Beauty blocks. I even have a calendar quilt top, one with a different block for each month, that I started a few years ago. It was a Block of the Month (BOM) project, probably my first. Kasey seems to like it, which is incentive enough to turn it into something lovely. I liked making BOMs so much that I was hooked and have done several more since. This quilt is very busy with lots of different colors. I have actually been thinking about this one a lot lately. It is a lap size quilt at the moment, but there is no reason I couldn't add a border to it, or even several borders. I think it would make a really lovely quilt when it is all finished. I would like to put it together and perhaps quilt it on the machine. It would be very challenging to come up with quilt designs for all twelve of these very diverse blocks. There is the Jinny Beyer quilt kit from Jinny's Craftsy class--the 2015 BOM--that remains in the plastic sleeve it came in. I look at it every night, as it sits on a table in my room. I have been waiting for a large block of time to start on this one, but haven't found that yet. This one will be special, as Jinny is another one of my quilting heroes. She is such an incredibly talented quilter and lovely woman who I have related to since the first days I saw her on Simply Quilts, many years ago. I now have one more thing to add. Craftsy has another BOM for 2016. 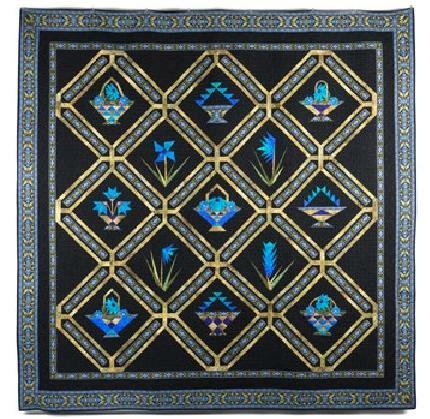 It is taught by Lynette Jensen, another quilting icon. 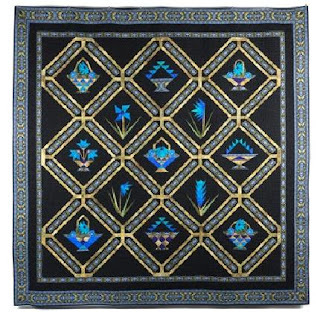 I really like this quilt and have decided that if at all possible, I'd like to make it. It starts out with a medallion-like center filled with hourglass blocks. It is done with borders and includes a pretty applique border.